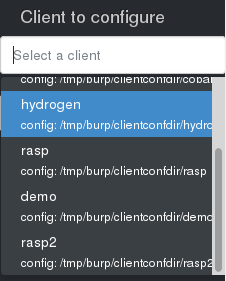 I'm pleased to announce you the v0.0.7.1 of Burp-UI. Burp-UI is a web-based interface aimed to monitor your backups, perform "online" restorations and administrate your burp-server. The project has been announced on this burp project mailing-list in June 2014. Here is the project homepage: https://git.ziirish.me/ziirish/burp-ui The project documentation is hosted here . You may find the complete changelog here . Please note the configuration file edition feature is still in heavy development and may suffer some (security) issues. There is a python pip package available, the installation procedure is described in the documentation . Note: the pip package is the 0.0.7.1 while the developing branch is the 0.0.7. This is due to a new policy on the pypi website that encourages releasing new versions of the packages where we could previously fix them inline. Due to this change on pypi, the next version of Burp-UI will be the 0.1.x Some new features are already planed for this version but the list is not closed yet. Please feel free to report any issue on the project issue tracker or on burp-users mailing list. This version of Burp-UI is the biggest so far with more than 250 commits . Here are some highlights of the new features brought to you with this release. For the next version of Burp-UI, I will try to focus on the UI. You can find the full roadmap here . I would like to thank the contributors for their bug reports and/or code contributions. Special thanks to Graham for his work on Burp, the whole Burp-UI project would not exist without him. He also worked hard on the burp-2 status protocol making the implementation of the burp-2 backend possible.